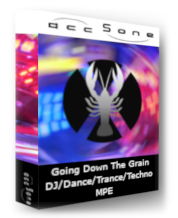 148 exquisite effects (crusher-sheets) for DJs, Dance, Trance, Techno and MPE performers. Each patch is available as an interactive or MPE (MIDI Polyphonic Expression) version. From crusher-X 7 version up the MPE patches can be directly live performed with your MPE keyboard. Give your track the grain!